Using Diagram Filters (Dynamic Visual filters), you can modify the display of diagram components so that the required items are immediately identified, without damaging the structure and integrity of the model. The filters operate on elements, connectors or Tagged Values according to properties such as Author, Status, Date Created or Stereotype Value and, for connectors, whether the connector is hidden or visible. Filters are stored against the model, so a filter you create is available to other users of the model; however, use of a filter is specific to the user, so your use of a filter does not affect another user's view of the diagram. 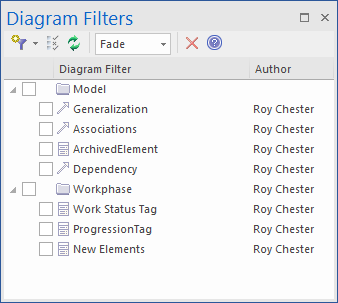 Filters for elements can also be applied to the Package Browser and Diagram List. The 'Diagram Filters' context menu (right-click on the body of the window) provides an option for toggling between the filters and simple context filtering of diagrams; if you select the 'Context Filtering' option, the Diagram Filters are disabled and the contents of the diagram are grayed-out, except for a selected element and those elements directly related to it. You create and define as many filters as you require, setting up each filter by defining which element, connector or Tagged Value properties to specifically check for and (depending on how you set up the filter parameters) whether to include or exclude elements or connectors having particular property values. You cannot combine element, connector and/or Tagged Value properties in one filter, but you can apply any combination of element filter, connector filter and/or Tagged Value filter to a diagram at the same time, individually or as a grouped filter. If you select 'Gray Scale', 'Fade' or 'Hide', the action of the filters is to exclude items that do not match the parameters rather than include items that do. Does 'Name' contain string 'Class'? If 'No', apply effect; if 'Yes', take no action. The elements you want are therefore what is left on the diagram, rather than what was operated on. The filter effect remains in force while you do other work on the diagram, until such time as you disable the filter. Does 'Name' contain string 'Class'? If 'No', take no action. If 'Yes', apply effect. In this case, the filter effect is not permanent, and clicking off the items deselects them. This effect is excellent for selecting items having the same characteristics across a large diagram, to be processed in a single task; instead of having to locate the items and select them with Shift+click individually, you can apply the filter. If you inadvertently lose the selection by clicking off the items, you can get it back again almost immediately by re-applying the filter.